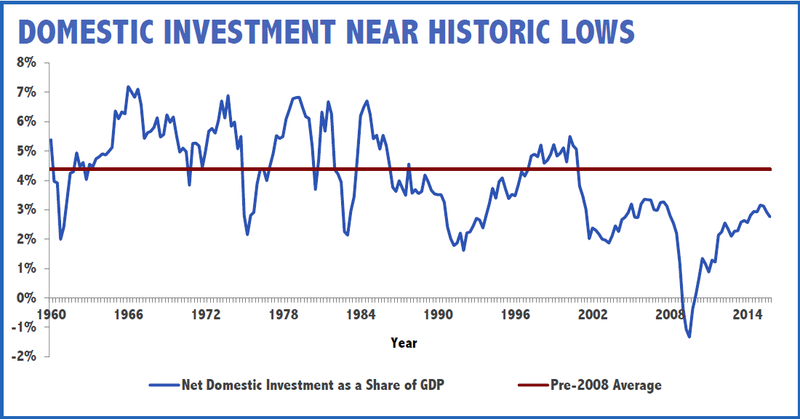 Several of my recent posts have been devoted to the topic of faster economic growth, see, for example, here. One way to do this is by making it easier to start and grow a small business. Another way is with broad-based tax reform. The current seven tax brackets for individuals are condensed to just three: 12%, 25% and 33%. The standard deduction of $12,600 (for joint returns) is raised to $24,000 and the $4,050 personal exemption is eliminated. This feature means that fewer filers will need to itemize deductions. In fact, all itemized deductions for individuals are eliminated except for mortgage interest and charitable contributions. To encourage business creation and expansion, the pass through tax rate for small business will be 25%. Full and immediate expensing for investments in new equipment and technology will be allowed. The corporate tax rate will drop from 35% to 20%, paid for by eliminating dozens of tax carve-outs and deductions, including net interest expensing. A territorial system will be established whereby multinational firms will no longer be taxed both abroad and at home for the same dollar of income. This will encourage the multinationals to keep production facilities in the U.S. and to bring home foreign profits for reinvestment here. The purpose of this plan, according to Kevin Brady, Chair of the House Ways and Means Committee, is “to rev up the economy, cut taxes on business, simplify the code and let American families file on a postcard.” The authors of the report claim that this tax proposal is revenue neutral, i.e. will not lower tax revenue, on a dynamic scoring basis, taking resulting economic growth into account. If this assertion holds up under nonpartisan analysis, then this is an excellent proposal which deserves broad support. This entry was posted in economic growth, House Ways and Means Committee, Jack Heidel, Kevin Brady, tax policy, tax preferences, tax rate cut, tax reform, tax revenue, Wall Street Journal and tagged economic growth, House Ways and Means Committee, jack heidel, tax reform, Wall Street Journal by jackheidel. Bookmark the permalink. I appreciate the information. I will follow, what you term non-partisan interests. Here I think you are moving too quickly to find someone ‘objective’. Since we are dealing with people as well as the analysts, I cannot help but think that too many subjective factors will enter everyone. For sure, economics is no objective science such as chemistry or physics. Thus, I have to bring ethics into the material itself. I definitely think about the moral aspects of the policies I support or oppose. I want policies that not only work but also are viewed in a favorable light by most citizens. But back to your comment on morality, I do find too many older white people in all classes but specifically the working classes to be too racist and anti-immigrant. I understand the economic reasons for their positions. Yet, I know the wealthier countries have a moral responsibility to all citizens of the world. At least, it ought to be to prevent starvation and aid for economic development. No doubt many older white working class people are too racist and anti-immigrant. This is probably the main appeal of Donald Trump. These people are hurting economically and public policy is not responding enough to their legitimate needs. I’ll continue this theme in my next post tomorrow.